I had originally bought Imani a different Easter dress but the other day as we strolled through Target, she began squealing about seeing a "princess dress". I mean, she was seriously freaking out about it. How funny...such a girl! It's a cute dress, but looks a little bridal to me. More flower-girl-ish than for Easter. 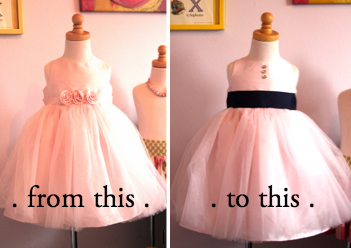 I knew immediately that I wanted to change the sash so the rosebuds & bow had to go. Do you have a seam ripper? It's one of my favorite little tools. Off came the flowers...then the bow in the back. I like it better already! Just needs a little steaming before my next step. I had hoped to find navy & white striped ribbon but after going all over town, I settled on this 2" navy grosgrain ribbon from Hobby Lobby. Because I didn't want the sash to move around as she wears it, I made tiny stitches at the very bottom of the ribbon. I had thought about using preppy looking gold buttons, but Imani liked the bling. So we went with that. I struggled with the spacing & whether to use 2 or 3 buttons. But I love how it turned out. What a simple & fast project. Such a transformation from the cute but generic Target dress! I'd hoped that Imani could model her beautiful new dress for you but my precious little girl has been sick all weekend. I put it by her bed so she could ooh & ahh over it though. And she has. Again...such a girl. I'll definitely post some photos of her wearing it on Easter. Can't wait for our little girl to look like the princess she is. ...what is it with girls loving princesses...even at age TWO? !